George Graham Church of Betty's "Swirled World"
Among the various retro trends on the scene, from rockabilly to soul to art rock, the 1960s psychedelic era has also been the inspiration for a number of bands. One the one hand, there are the young artists who may have heard such music from their parents’ record collection, and there are musicians around who go back at least part of the way to that period. They bring a little authenticity, while the young players can bring their creativity. This week we have a new recording from a group led by an artist whose musical career goes back about halfway – to the late 1980 -- with interesting results. The group is called Church of Betty, and their latest recording bears the seemingly appropriate title Swirled World. Church of Betty is a musical project initiated by Chris Rael, who grew up in Maryland and moved to New York in 1986 to try to advance his career. He began working with a number of artists whose music defied ready categorization. As an outlet for such music, he founded and still runs a label called Fang Records, which has been around for some 25 years, releasing occasional Albums by Church of Betty and other groups and artists Chris Rael was hanging out with. Early on, Rael took an interest in Eastern and Indian music, so he traveled to India in 1988 to listen and study music there. Rael took up the sitar and he has played it as a part of the Church of Betty sound over the years. In its early days, the band became a part of the thriving art rock scene at venue called the Knitting Factory in Greenwich Village. The band also toured Europe in 1993 and while in England, Rael collaborated with a number of Indian musicians he met there, which resulted in an album called Forbidden Kiss, based on music from Bollywood composers. Church of Betty released four albums between 1998 and 2003 when the members scattered geographically. Rael moved to the Los Angeles for a while and became involved with creating music for soundtracks and theatrical pieces. Rael moved back and is living in Brooklyn now and occasionally the Church of Betty members will get together. 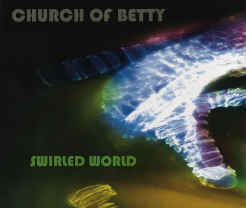 The new album Swirled World is the first new studio album officially by Church of Betty since 2003. And it’s a fun mix of Eastern and other slightly exotic sounds with a kind of loose theatrical rock setting, featuring a motley collection of instrumentation including strings and a prominent bassoon, which adds a sometimes goofy sounding texture. The whole thing evokes a kind of hippie collective musical atmosphere. The compositions are often interesting with occasional complicated rhythms, and at other times can evoke the sort of rock-opera sound from back in the days when such things were done. Rael does most of the musical heavy lifting with his guitar, sitar, some bass. Others on this CD include Brian Geltner on drums, Chris Cochran on guitar, Rima Ford on violin, percussionist Otto Hauser, and frequently heard, Claire de Brunner on bassoon. The original material ranges from almost pop-oriented to rather quirky both musically and lyrically. Church of Betty has the kind of slightly loose sound that makes it appear as if the musicians were brought together and just played, rather than working from careful arrangements. So that adds a degree of spontaneity. There are also other world music influences, such as Eastern European. The sitar and the modal structure of the music can harken back to the Beatles Indian influence, another factor evoking the sound of the psychedelic days. The title track Swirled World is for me, one the of least artistically successful. The lyrics are worthwhile, but the arrangement is somewhat chaotic, with the instrumentation seeming as if whoever showed up for the session got to play on the track. It’s all over the place both in orchestration and stylistic influences. Swirled World, the rather well-named new album by the long-running project Church of Betty is an interesting and fun stylistic pastiche of rock, pop, retro psychedelia, world music and a general assemblage of different musicians and styles in what reminds me of a hippie “happening” back in the day. To be sure, it’s not a purely retro album, and there are some interesting compositions, but the atmosphere is loose and a lot more freewheeling than some of the recent creative, and more carefully arranged, cross-cultural fusion projects. The music manages to strike a good balance between being appealingly tuneful, and playfully experimental. Our grade for sound quality is about an A-minus. It’s generally well-recorded and the use of needless studio effects is held in check. But as is the case with most rock CDs, the dynamic range, the span of loudness, is restricted by the mindless use of volume compression. With several generations of musicians on the scene these days, and music inspired by past era being done by young players and some of the original artists, Chris Rael and Church of Betty is a long-running group that come from between those generations, and as a result brings an interesting and appealing perspective.